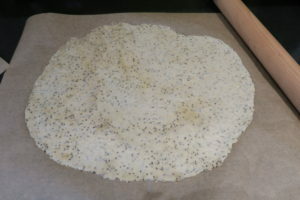 I was inspired to make these Sesame & Chia Seed Crackers after watching The Great British Bake Off. Before watching I hadn’t thought of making crackers from scratch before, but it’s actually really easy to do and by making them yourself you can customise the flavour to your own preference. I really love seeded crackers, particularly the texture and appearance. Plus chia seeds are so good for you, so it’s nice to know there’s something healthy in there! 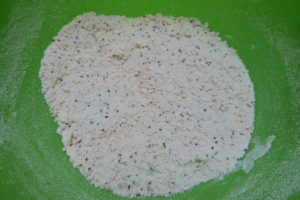 I started by putting plain flour, baking powder, salt, chia seeds and sesame seeds into a large bowl. Then I stirred the mixture together so the seeds were evenly spread out. Next I added the butter and rubbed the mixture together with my hands until it resembled breadcrumbs. Then I made a well in the middle and poured in the cold water. 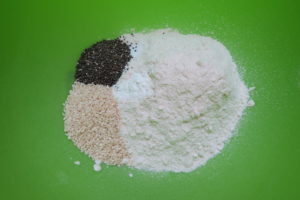 I mixed it together until a dough was formed, I did add another small splash of water as it was slightly drier than I wanted. Then I shaped it into a ball, covered it with cling film and chilled it for 20 minutes in the fridge. 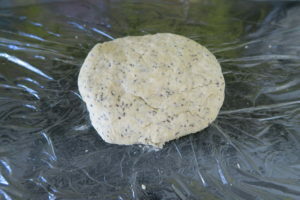 I rolled the dough out between two sheets of baking paper until it was 1-2mm thick. 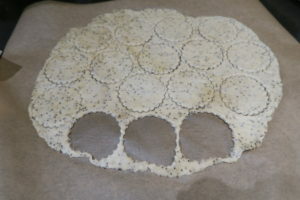 I used a 6cm cutter to cut out the cracker shapes, but you can use any size or shape of cutter you like. The dough made 34 crackers. 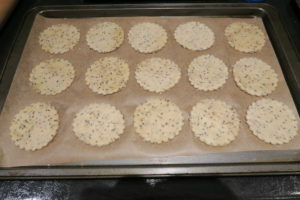 I placed the cut out crackers onto the baking trays and pricked them a few times each with a fork, I also sprinkled coarse sea salt over them. They baked for 10-15 minutes until they went golden around the edges. 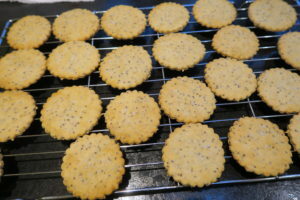 I’m really pleased with how the Sesame & Chia Seed Crackers turned out. They looked great as well as being nice and thin, with a good snap to them. Once cool, the Sesame & Chia Seed Crackers are ready to eat straight away! 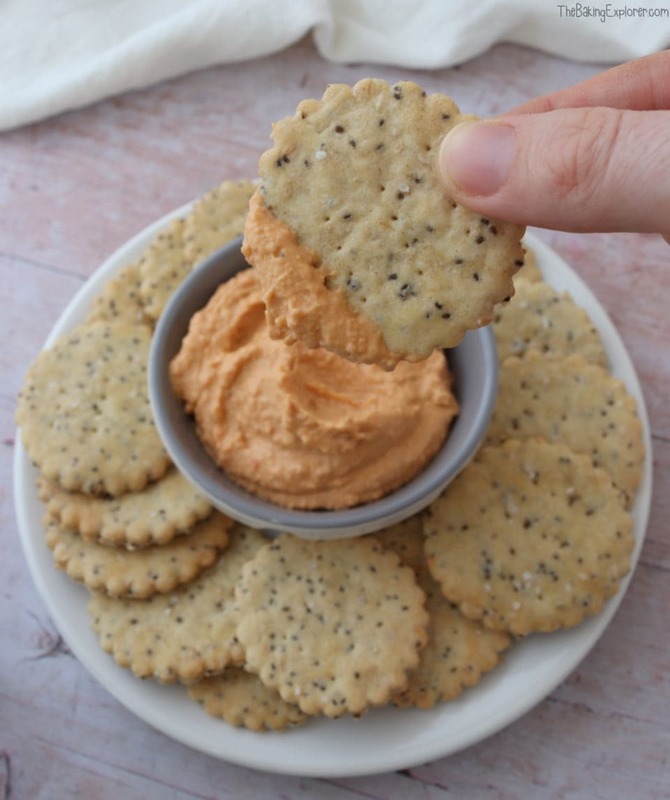 Crackers are so versatile, you can put cheese or paté on them, dip them in hummus, or just smear some butter or cream cheese on top. 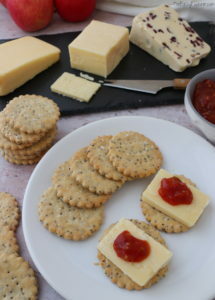 These Sesame & Chia Seed Crackers are so yummy and moreish! They won’t last long!